To mark the countdown to the start of the Unibet EuroHockey Championships 2015 we’ve launched a brand new video to whet your appetites. Check it out below! If that’s left you wanting to see more of the action first hand, don’t forget to visit www.eurohockey2015.co.uk/tickets/ to secure your seat today! 100 days to go: Exciting opportunities for young hockey fans. Have you bought tickets to Unibet EuroHockey Championships 2015? Would you like to make the experience an even more unforgettable one for your son, daughter or one of your pupils? As part of our celebration of reaching the landmark 100 days to go we are offering the chance for children between the ages of five and eleven to be one of our ball deliverers for each of the games. The lucky children chosen as ball deliverers will be able to walk onto the hallowed turf of the Lee Valley Hockey and Tennis Centre to give their hockey heroes the match ball for the game about to take place. All you have to do to put your child forwards for this incredible experience is to fill in the form below by 21 July 2015 and cross your fingers. It promises to be a fantastic summer of hockey, why not make it even more incredible for the young hockey fan? Kate Richardson-Walsh won her 100th Great Britain cap against Korea at the London Prepares series on 01/05/2012. The England captain has since gone on to amass 336 caps for Great Britain and England combined. Ashley Jackson, England and Great Britain’s record goal scorer netted his 100th international goal in the opening game of the Commonwealth Games against Trinidad and Tobago on 24/07/2014. Jackson currently has 112 international goals, surpassing the 110 scored by previous record holder Calum Giles. Jackson won his 100th international cap alongside Adam Dixon against Belgium at the World Cup on 10/06/2014. England’s Ali Brogdon won his 100th cap in the Champions Trophy against Argentina on 13/12/2014. Ireland’s Alan Sothern won his 100th cap against Germany in a test match, on 11/05/2015. Sothern marked the occasion with two goals. Jill Boon and Tom Boon, the famous brother and sister combination for Belgium have both collected over 100 caps with their combined total now swelling to over 350 international appearances between them. Lidewij Welten and Marie Mavers of Netherlands and Germany won their 100th caps when the two sides met at the Champions Trophy on 4/12/2014. Welten will have emerged the happier of the two as her side ran out 1-0 winners. Despite an average age of just 24, the Belgium men’s provisional squad contains ten players with over 100 caps: John-John Dohmen, Jerome Truyens, Cedric Charlier, Thomas Briels, Felix Denayer, Simon Gougnard, Elliot Van Strydonck, Tom Boon, Vincent Vanasch and Florent Van Aubel have all surpassed the mark. 100 is undoubtedly a very special number for international athletes and a special number for us as we lead up to the big day on 21 August. Why not Tweet us @Eurohockey2015 your favourite 100s using #100daystogo or tell us what you’re looking forward to most about the tournament. If you’d like to buy tickets to the Unibet Eurohockey Championships 2015, you still can. Just visit this link and make sure you secure your seat at the hottest ticket in town this summer! Over 20,000 additional tickets are now on public sale for the Unibet EuroHockey Championships 2015, including for the Finals and England sessions which had previously sold out. These tickets are in high demand and are likely to sell very quickly so fans are urged to secure their seats for Finals, Semi-Finals or England sessions as early as possible. Click on the tickets link on this website to buy yours. The expansion of the Lee Valley Hockey and Tennis Centre stadium is a result of the huge interest around this much-anticipated event on Queen Elizabeth Olympic Park, featuring the best teams in Europe including both England teams who will be aiming for medals. 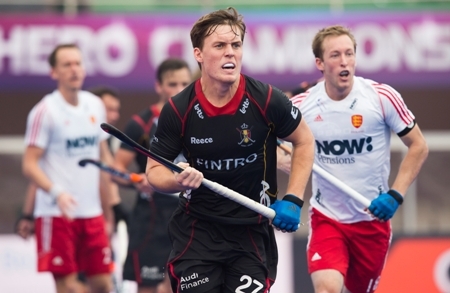 The Unibet EuroHockey Championships 2015 forms part of an exciting British summer of sports events, alongside cricket’s Investec Ashes series, the Rugby World Cup. It provides another chance for the British public to show their national pride and unite behind their teams as they have a realistic chance of silverware – England’s women’s team won a Silver medal at the 2013 Championships. Lee Valley Hockey and Tennis Centre is hockey’s Olympic legacy stadium and the event offers crowds an opportunity to relive the atmosphere created by the hockey at the London 2012 Olympics, where it was the highest-attended team event with 630,000 people enjoying the thrilling action. The event promises a fantastic day out for families and general sports fans. There will be entertainment on and off the field, with a large fan park offering a full day’s activities for all ages. England Hockey’s Commercial Director Jonathan Cockcroft commented: “Hockey is growing as a spectator sport, and this stadium expansion demonstrates that more and more people are realising what a great day out hockey is. Not only is the action on the pitch fast-paced and exciting to watch, but we provide a fun environment for families. We’re confident that fans will have a great time at the Unibet Eurohockey Championships 2015”. Hospitality packages are also available at the event, with two packages available, and there are still sponsorship opportunities available.